The sixteen artists presented by Patrick Morrissey and Clive Hanz Hancock in Crossing Lines all share reductive, formal, or non-objective approaches to image making. With roots in early 20th century Modernism, reductive abstraction has long been a strong undercurrent running counter to the dominant conceptual movements of the last thirty years or more. The early 21st century has seen a return to and re- examination of the non-objective in contemporary art, and this exhibition is situated within the context of that renewed interest. 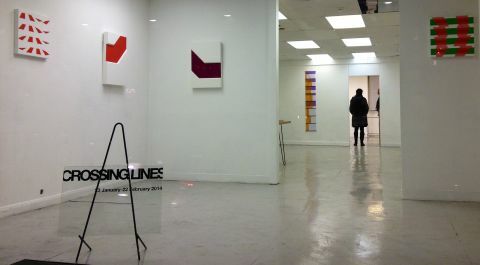 Crossing Lines constitutes an artists’ group involved in an extended conversation around a shared concern with the debates that surround postmodern abstraction and how they might inform contemporary practice. Reflecting the traditions of formalist approaches whilst challenging their boundaries and seeking new directions.